Bubblegum, the newest drama on tvN, seems at first glance to be a mere rom-com. But it has an interesting mix in its tone: it brings the cutesy nature of rom-com dramas together with the gravitas of a family drama. Perhaps it’s the fact that the drama starts in media res that makes it seem so dramatic, or maybe it’s all of the sweet songs on the soundtrack paired with the absolutely adorable doodles that give the cutesy nature. But we’re only six episodes into the show, and so much has happened and been explained in both the romance and drama departments. So much that I can’t believe we’re not at episode 10 or 11 in the middle of the dramas second act with these kinds of developments. Late night radio producer Kim Haeng-ah (Jung Ryeo-won) and Eastern medicine doctor Park Ri-hwan (Lee Dong-wook) are clearly childhood friends, but there’s also something more there than just friendly sibling-like care for one another. It doesn’t take long for that to see the light with the show they put on to deter Haeng-ah’s recently pronounced ex-boyfriend Kang Seok-joon (Lee Jong-hyuk) from pressing her to come back. 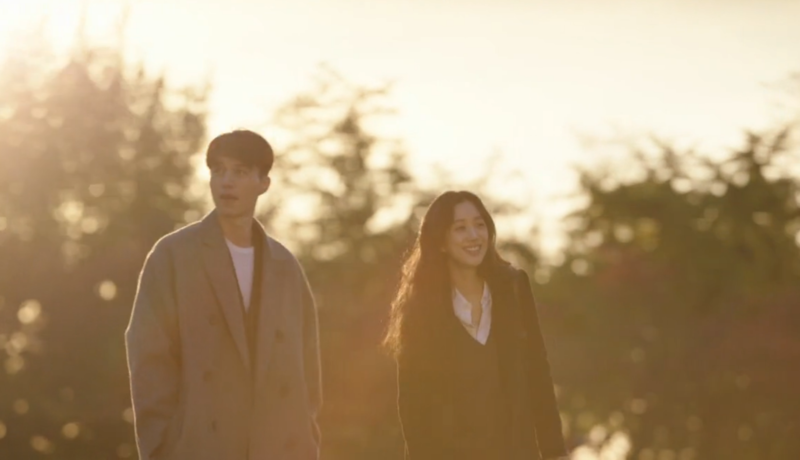 Their kiss sets off sparks between them, and we get all kinds of cuteness from Haeng-ah trying to avoid her feelings, Ri-hwan embracing them, and finally the two taking hesitant steps with a date that they’re not calling a date. It’s cute, and I love it. Jung Ryeo-won and Lee Dong-wook have great chemistry, playing off each other quite well. Jung Ryeo-won brings her sharp tongue and energy to the earnest but guarded Haeng-ah, and I couldn’t ask for a better actor to play her. Perhaps I’m biased, considering I watched this drama specifically for her, but Jung Ryeo-won really fits this character well, giving her a wonderful balance of vulnerability and strength that is nuanced and realistic. I’m just waiting to see more of Haeng-ah’s emotional — not necessarily romantic — vulnerability, due to her being alone in the world. We’ve seen it in small bits when talking about the possibility of losing Ri-hwan and his mother, but I just need a little bit more. Opposite her, Lee Dong-wook gives a serene kindness to Ri-hwan that suits the caring doctor image he has but also manages to infuse him with a romantic side that is neither a barf-fest of mush nor some over-the-top sexist fantasy of control and masculinity. He — in his pink coat — is also quite funny, sweet and so, so nice. I’d also like to see more vulnerability from him in terms of romance. He seems to be protective and serious when it comes to the relationship, clear in his handling of Seok-joon barricading himself in the studio with Haeng-ah and Yi-seul’s brother punching her ex-fiancee at the restaurant, but it’s not clear why he is that way. 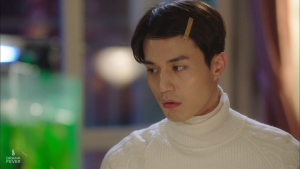 Despite how great Haeng-ah and Ri-hwan are together, in K-dramaland the situation could never be so easy as to allow two people who have feelings for one another to date. No, these moments are always accompanied by at least one interfering mother. In this case, we have two. First, Ri-hwan’s mother Park Sun-young (Bae Jong-ok) wants a wife of excellent standing for her son that is explicitly not Haeng-ah, as the show has reminded us time and time again via flashbacks and awkward conversations in the present, though her reasoning behind that isn’t completely clear. This shouldn’t be a big deal, since Ri-hwan claims that his mother just wants him to be happy and will support his decision. But we’ve just discovered the fact that Sun-young is now experiencing early onset dementia in the form of Alzheimer’s that can also — surprise, surprise — be inherited. Oh, yeah, and it doesn’t help that apparently she tried to commit suicide when Ri-hwan was just a kid, so her opinion on this potential relationship matters. Clearly, the cards are stacked against Ri-hwan and Haeng-ah’s relationship just in the form of his mother. The second mother, the always fabulous Park Jun-keum as the matriarch of a chaebol family known as the Taeyang group, has yet to actually meet with Ri-hwan but clearly will soon, and I’m already pretty much dreading her meddling. Her daughter Hong Yi-seul (Park Hee-bon) is head over heels for Ri-hwan, and it’s no surprise considering the pressure her mother is always putting on her with snide comments about her clothes, her weight and any other aspect of her appearance, and the terrible precedence set by her ex-fiancee. All she’s needed is someone who is not her doting older brother to actually be kind and thoughtful, and Ri-hwan fits the bill. Unfortunately, he doesn’t return her feelings. Even though Haeng-ah and Ri-hwan are the bees knees, I’m disappointed because Yi-seul with her wide-eyed hurt and soft smile is my favorite character even if she does need a bit more fleshing out. In fact, I appear to be suffering from my first case of second lead syndrome for a female character. 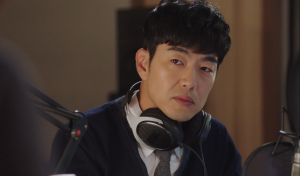 A character I’m still waiting to see more from is Seok-joon. I get it: the guy is clearly horrible at expressing emotion, though PDA in an elevator isn’t off limits apparently. He’s also devoted to his job more than to his girlfriend. He can’t seem to pick up on social cues from other people about how they’re feeling. Oh, yeah, and he doesn’t know how to say I love you. With all of that, it’s difficult for me to understand what Haeng-ah even sees in him, other than the fact that he’s physically attractive — Lee Dong-wook’s got a leg up on Lee Jong-hyuk in that department, though. Sure, she’s admitted that she lied about how she was feeling throughout the course of their relationship, but it’s also because of the kind of emotionally cold guy Seok-joon is. It’s this weird catch-22 where he didn’t give her any emotional support since he didn’t know that she needed him, but she didn’t admit she needed him since she thought he wanted someone distant and independent like him. The relationship was absurd and bound to fail. Besides the need for further character development, the narrative is also a bit messy, jumping between the past and present a bit too quickly and failing to give us enough exposition. Despite that, I remain intrigued to see where this drama will take us. After only a few episodes, so much has happened that would normally occur closer to the second act rather than the first. It’s too soon to tell if this means we’re about to get riddled with melodramatic nonsense — though that removal of the phone battery in Haeng-ah’s phone plus Park Jun-keum’s involvement might speak to the contrary — or if we’re going to get an actually interesting plot that doesn’t follow the usual progression of events. Either way, I am enjoying this. Perhaps it’s because the cinematography is just so gorgeous and crafted compared to most dramas. Or maybe it’s because the tone is unusual. I’m not sure what it is, but something is different. It’s hard to say if that will be great or very, very bad, but I’m willing to tag along for the ride in the meanwhile. Readers, what are your thoughts on Bubblegum?